Cape Grace Hotel Fynbos Tour offers in-house guests the unique opportunity to experience one of the Seven Natural Wonders of the World and its fascinating floral kingdom while sipping on a delightful range of wines. Derived from the Dutch word meaning “fine bush”, fynbos is one of only six floral kingdoms in the world and it is the only one that occurs entirely in one country – South Africa. At the highest point of the Safari, Table Bay, False Bay, the Durbanville wine ward and the dramatic Hottentots Holland mountain range, are all clearly visible. This exclusive wine tasting spot is in the company of historic cannons which, hundreds of years ago, were used as an early warning to signal ships approaching the Cape of Good Hope. It is here that guests relax and enjoy never-ending views accompanied by a selection of superlative wines and tasty nibbles. In addition to experiencing the hidden wonders of Table Mountain’s expanse of fynbos, guests will also be contributing to the preservation of the Natural World Heritage site. Ten percent of all proceeds are donated to South African National Parks (SANParks) for the conservation and general upkeep of South Africa’s national parks. Guests are also gifted Cape Grace’s Fynbos Collection of amenities to take home and enjoy – a sensory reminder of their memorable experience. 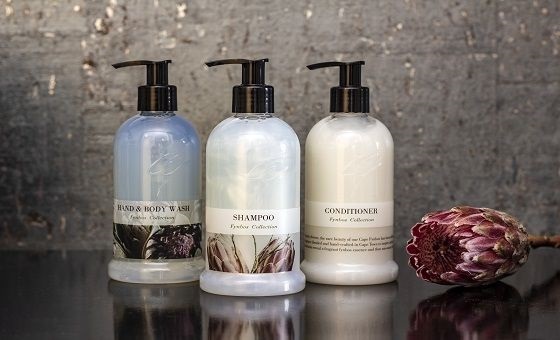 The Fynbos Collection was developed exclusively for Cape Grace in collaboration with local fragrancier, Agata Karolina, founder of perfumery – House of Gozdawa. The fynbos fragrance pays tribute to the hotel’s cradled location between land and sea – interpreting it with a captivating tapestry of scents. Distilled from 100% natural oils, the fynbos fragrance includes fresh top notes of locally-grown citrus and middle notes of earthy fynbos, grounded by wooded tones of Vetiver. The base of the amenities collection has been chosen with equal care, the softening emollients luxurious on the skin. Locally designed packaging has also been created to be as minimal and reusable as possible – sustainability kept front of mind. Kindly note that a light picnic lunch and entrance fees are included.